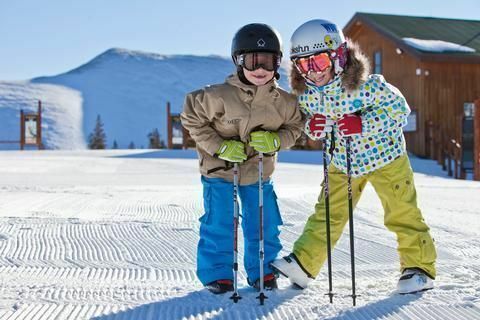 Kids play in the snow at Keystone; photo: Julia Vandenoever courtesy Keystone Resort. 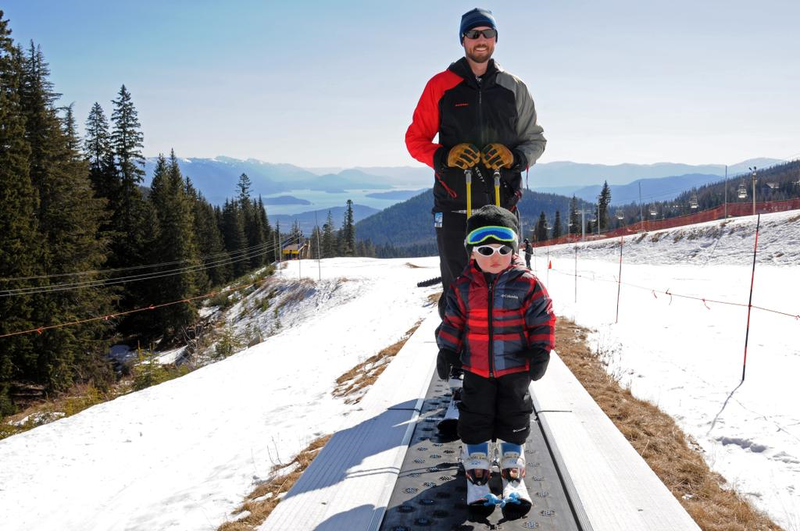 Schweitzer family shares #firstdayfaces during Learn to Ski and Snowboard Month. Kids Free and Student Learn To Ski Passes provided to local schoolchildren by several states are a great value for family ski vacations and introduce residents to the winter recreation around them. We like to apply the expression “think globally, act locally” to teaching our kids snowsports –- let them dream of conquering the runs at Sochi, but start them off small at a local mountain. Why not try a new sport when you’ve got nothing to lose? Neighborhood mountains are not only good value compared to big destination resorts (see our roundup of the best mountain resorts for families here), but they’re also easy to navigate and kid-friendly… just because they’re small. Never fear losing the kids at one of several base areas; these ski areas typically have all their learning facilities, equipment rentals, dining and daycare right by the parking lot. After a few visits, every lift operator will know your name and the cafeteria will remember whether or not you like whipped cream in your hot chocolate. Several ski states offer “passports” for kids of certain ages allowing them to ski free — once you have filled out the paperwork and paid a small processing fee — all season. There’s no better way than “free” to start your kids on a their lifelong love of learning, snowsports and the great outdoors. Third and Fourth graders at 20 resorts in New York – Beginner/Non-Skiers receive a free Learn to Ski or Ride lesson. Kids who have some experience receive up to 3 lift tickets at each participating ski/ride area if accompanied by a paying adult. A $27 processing fee applies. Fourth and Fifth graders residing in Pennsylvania, as well as kids that age from anywhere – Get a free Learn to ski/board lesson, and 3 coupons for complimentary children’s day lift ticket at each of 19 resorts. A $35 processing fee applies. Fifth graders in Vermont – even out-of-state 5th graders are welcomed to ski or ride with free lift tickets and passes for cross country trails at all Vermont resorts. A $10 processing fee applies. Fourth and fifth graders in New Hampshire and out-of-state grade mates get 1 free ticket to be used at each of 34 resorts. A $30 processing fee applies, and contributions are made to Make a Wish Foundation of New Hampshire. Fifth, sixth and seventh graders in Maine get free lift tickets and discounts; special offers for preschoolers too. A $30 processing fee applies. Fifth and sixth graders in Colorado, where 5th graders get a free pass for 3 free lift tickets at each of 22 resorts; 6th graders get 4 at each plus lots of discounts for a $125 processing fee. The Canadian Ski Council’s SnowPass allows 4th and 5th graders living in Canada to ski and ride free three times at each participating ski area all across Canada for less than CDN$29.94 — the pass processing fee is valid for two years as well, so apply as a 4th grader and use it for two years. In addition, many small resorts have “learn free” (or very cheap) days during the early season, during January, which is the national Learn to Ski and Snowboard Month (see more about our efforts to learn in Utah for LSSM here), and during the late season after spring break. The team at LSSM are doing two promotions this year, #firstdayfaces in which your kids can post pictures of themselves on social media, and the “Bring a Friend Challenge” to encourage skiers to bring new people into the sport. The Bring a Friend Challenge runs from January 5-February 18, 2018 and both offer chances to win prizes. The Pennsylvania hills are not the ideal destination for expert skiers but the 20 member resorts of the Pennsylvania Ski Area Association encourage learners by offering a $5 coupon off any midweek lift ticket at all their resorts. At Ski Sawmill in north central Pennsylvania, families enjoy special savings on certain days of the week. At Mount Snow, families can buy a Sunday Afternoon Four-Pack and get 4 lift tickets usable from noon to 4pm for just $99. Several states have made obtaining information and comparing mountain resorts easy by providing a central clearing house for information. We really appreciate the thoughtful details, tips and often, links to discount packages provided by these statewide groups. Take it easy and make it fun, that’s the best learn to ski advice we ever got. Once you’ve found a nearby ski hill, plan a day trip on a relatively warm day and see how the kids or adults in your group enjoy a new sport. If you’re having fun, plan a weekend outing next so you can relax together after a vigorous workout on the slopes. Some family hostels near mountain resorts with super cheap lodging even have lift ticket discounts at nearby ski resorts. Some of our favorite local mountains have cozy budget B&Bs and small motels nearby. These include Hunter Mountain and Windham in the New York metro area; Gore Mountain in the Adirondacks; Crystal Mountain — in the midst of big expansion — in Michigan; Wisp Mountain Resort in Maryland, Bolton Valley in Vermont; and Mount Rose on the North Shore of Lake Tahoe. These locally run and operated day resorts will invariably be cheaper than the bigger, more famous ones. And if you can visit mid-week, the package vacation values are tremendous. In fact, Brian Head Resort in Utah – a little place that thinks really big — is one of our very favorite mountains anywhere, at any time of year.